These photos were taken on June 15th, the day I picked up the nuc. Since it was Father’s Day I didn’t have time to do a complete hive check. My goal was to check Verbena to see if they’d eaten all their food, and open the nuc. First order of business, check on Verbena hive. Here I am opening the top. That’s an empty 2 quart mason jar, it was there for a week. Think those bees were hungry?!? 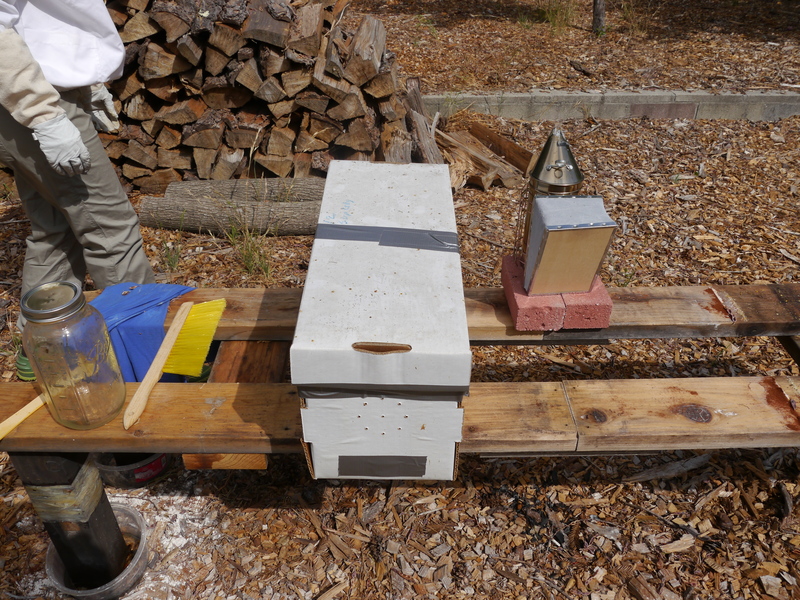 My husband wanted to make Verbena’s hive stand more stable. We temporarily transferred the hive another stand, right next to their current stand. It’s not recommend to move a hive more than a few feet, otherwise the bees can have a difficult time locating it. Here’s what was under the hive. 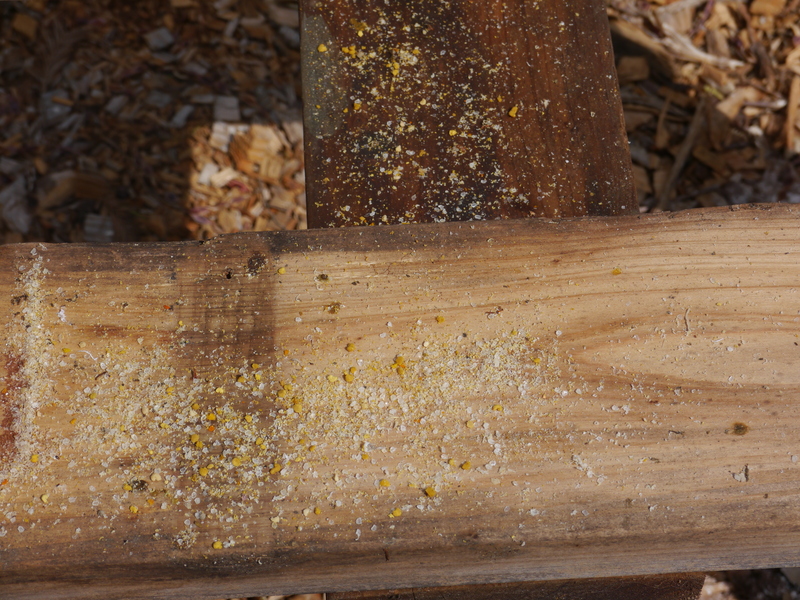 Lots of sugar crystals, and the yellow stuff is pollen. The bee in the lower, right corner has a full pollen basket on it’s hind leg. The other bees were busy cleaning up the pollen. More bees with pollen baskets. Click on the picture to get a better view. 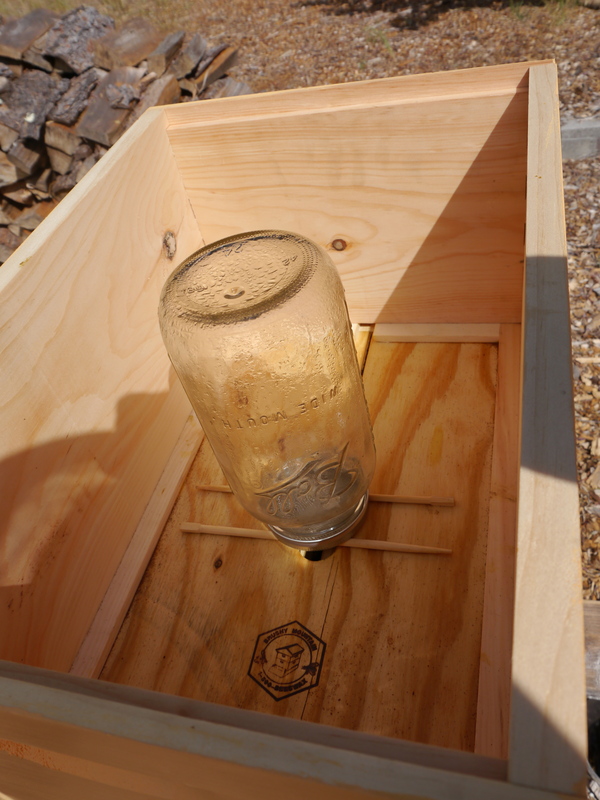 Here’s the nuc, ready to be opened. We let them settle for 30 minutes after pick up before attempting to open it. This piece of tape is covering the entrance, once opened I expected lots of bees to fly out. This is all that happened, fairly uneventful! 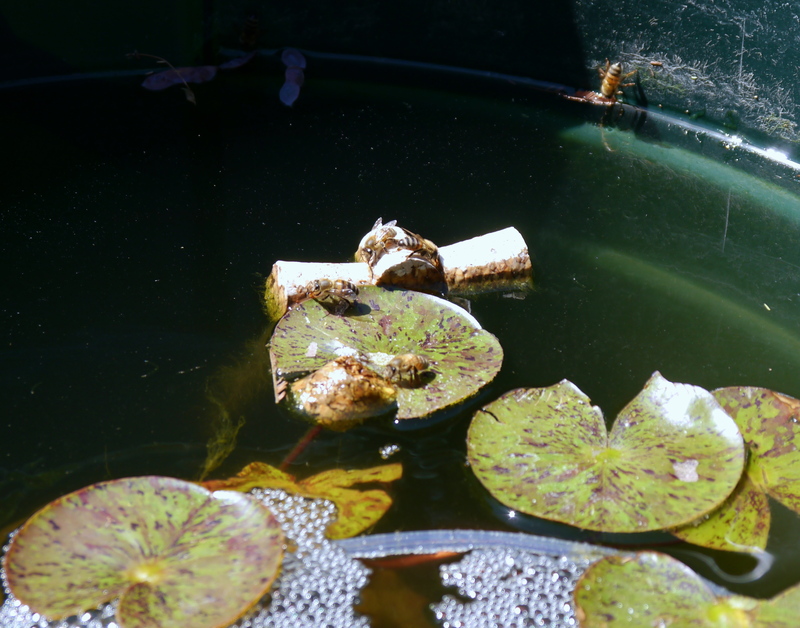 I took time to check out the bee pond too, there was lots of activity. Watching them drink, I was surprised at how much time they spent there. Here’s some interesting facts I found about bees and water collection. Time for a bee to load up, one minute. 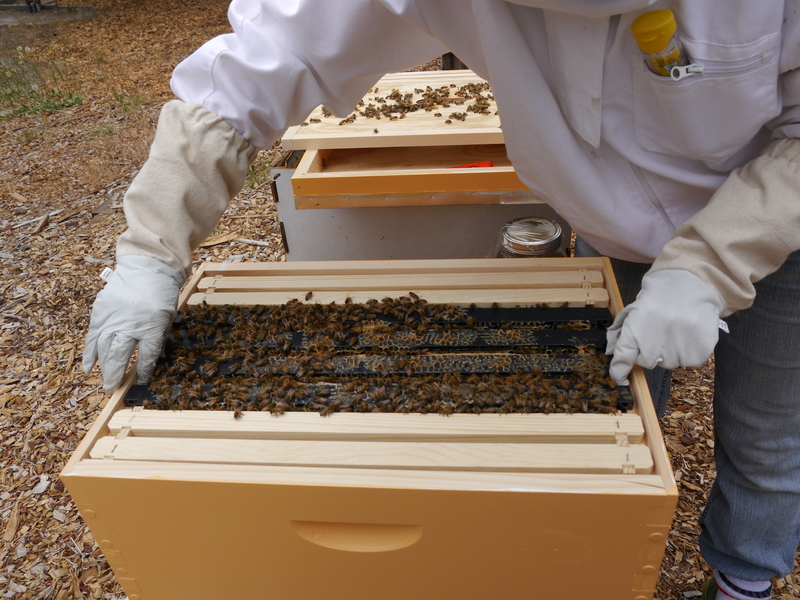 The next pictures are of the brief hive check of Cosmo hive that was started from the nuc. 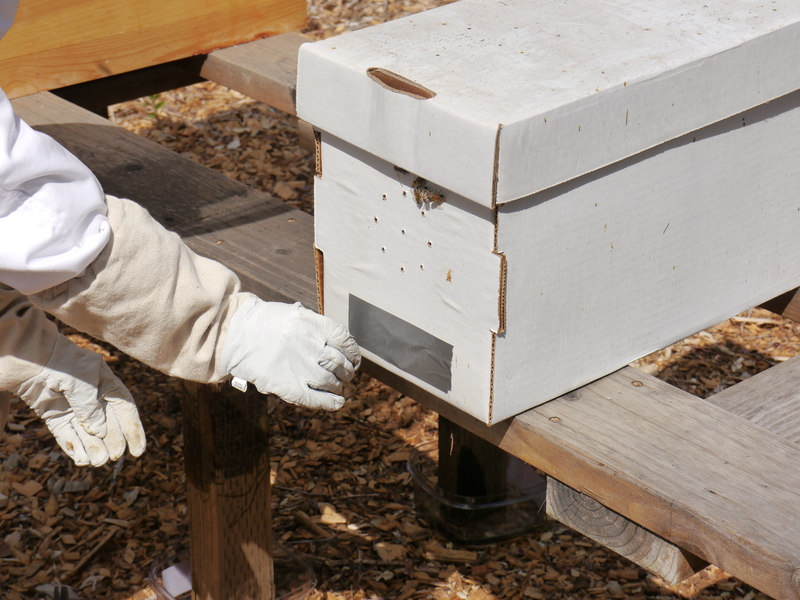 I unexpectedly had to transfer the frames from the nuc to the hive the day before. 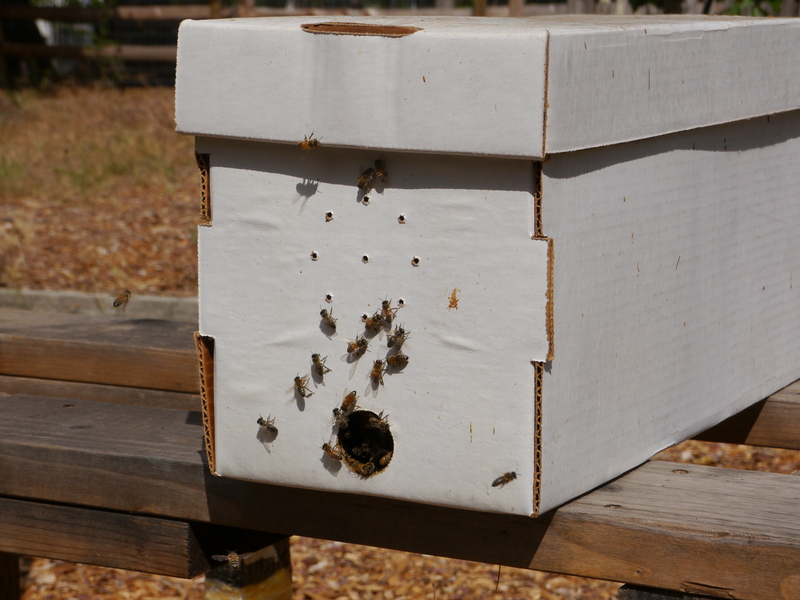 June 19th was an extremely hot day, and the nuc box doesn’t get much airflow. Around 2:00 there were a lot of bees hanging around near the entrance. I monitored things for a couple hours, and more bees started to pile up near the entrance and top. 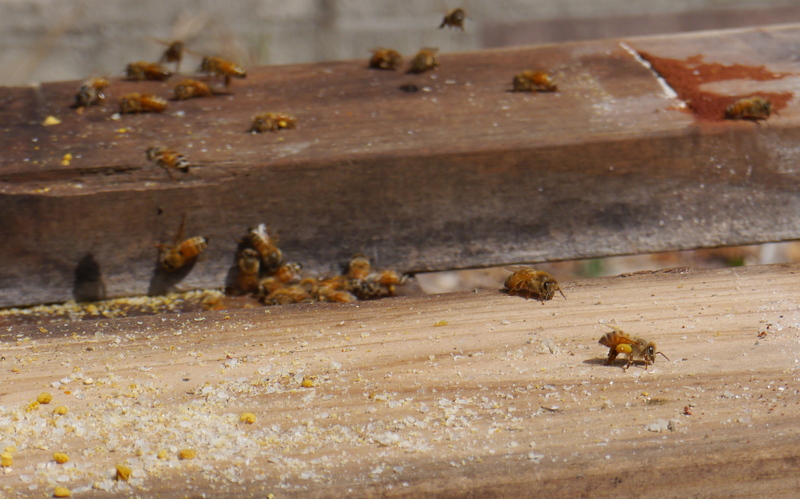 If a hive gets overheated, the bees will leave and swarm, and I didn’t want that to happen! At 4:00 I quickly got geared up, and did the transfer all by myself! 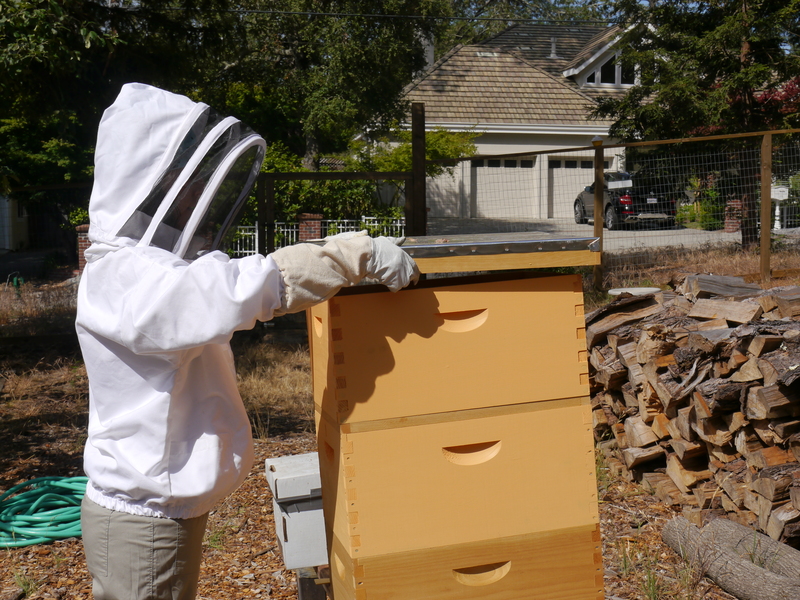 My only goal was to get the nuc frames into the new hive, and leave them alone. 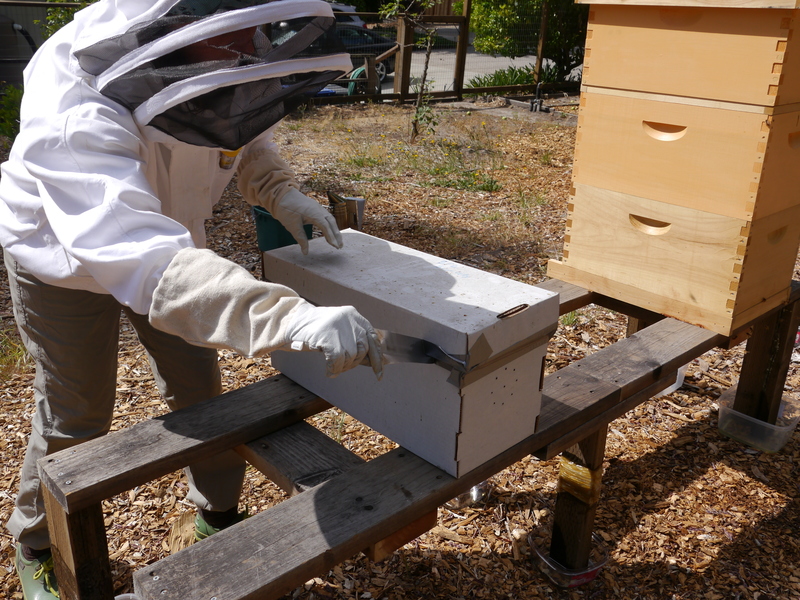 Thankfully everything went well, I didn’t drop any of the heavy nuc frames, and by the evening all the bees had settled into their bigger home. Here’s pictures from the hive check I did the next day. 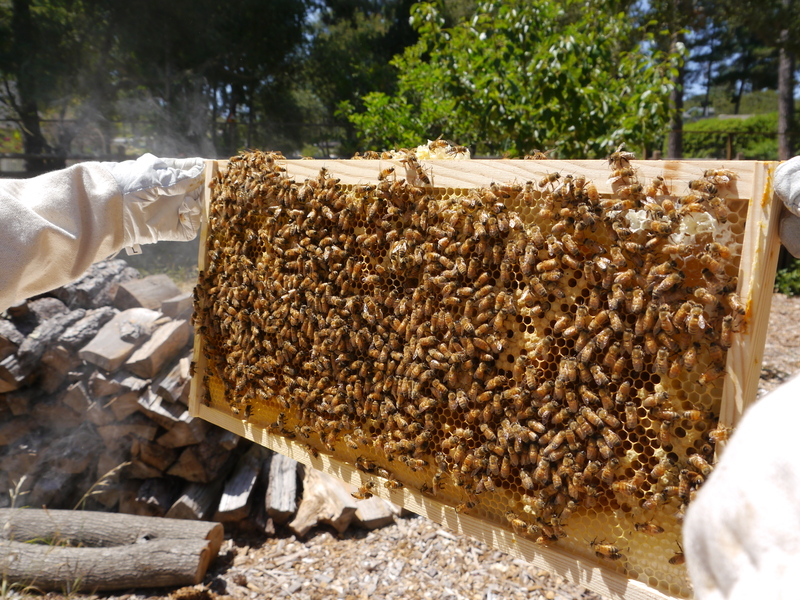 My goal for this hive check was to correct the frame spacing, look for Beeyonce, and look at the brood. I’m trying to lift out this very heavy frame. These frame have more brood and bees that my other hive. The weight difference is HUGE! 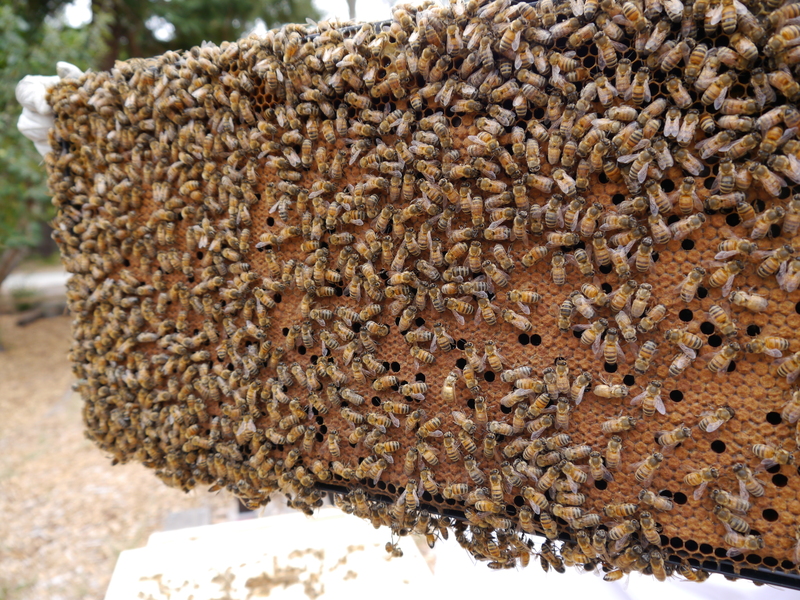 Here’s a full frame of capped brood. The patten is exactly what you want to see, it has very few uncapped cells. 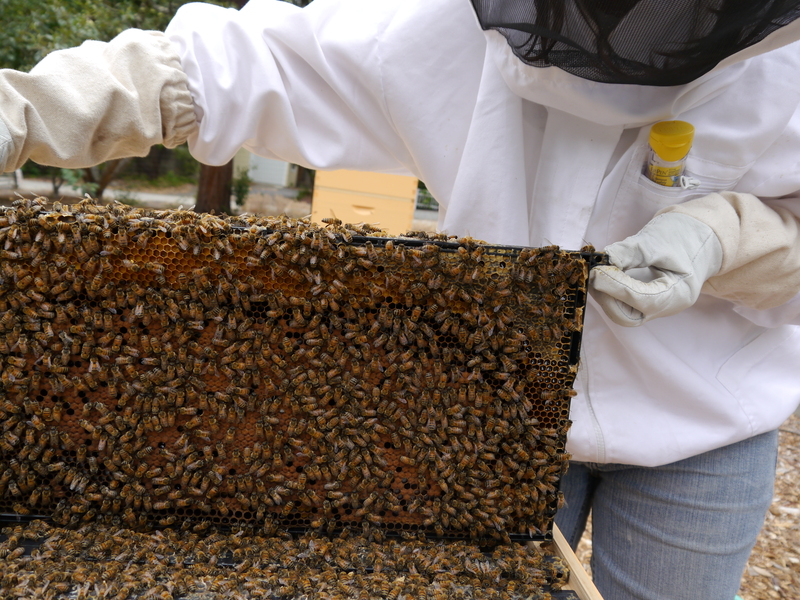 For comparison, here’s a frame from Verbena hive. Notice the difference in the amount of bees and brood ? There is less capped brood because they are waiting for the queen to lay eggs, then they cap it, and let the new bees develop. Another frame with nice looking capped brood. Here I am slowly replacing the frame. It was a completely new experience because it had so many more bees and brood. I had to move much slower when moving the frames, to avoid smashing bees. Unfortunately, we didn’t see Beeyonce, and I’m not sure if she is marked like Lorde. During my next hive check I’ll look for her again. 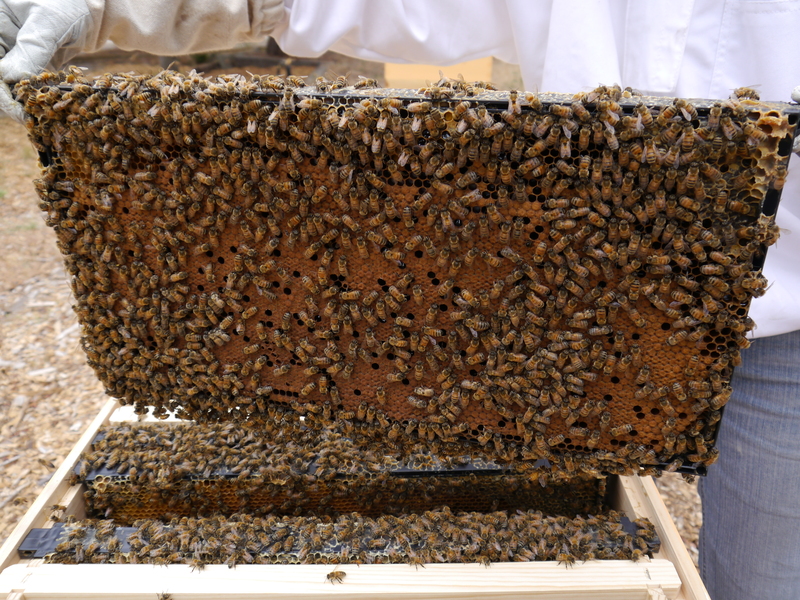 It’s a lot harder to spot the queen with that many bees on the frame! I’m now officially a keeper of two hives, WHOO HOO! Great pictures……I love your hive names and the new Queen bee’s name!! Thanks Janelle! I posted on FB awhile back that you won the naming contest 🙂 Message me your address and I’ll mail out the candles to you!